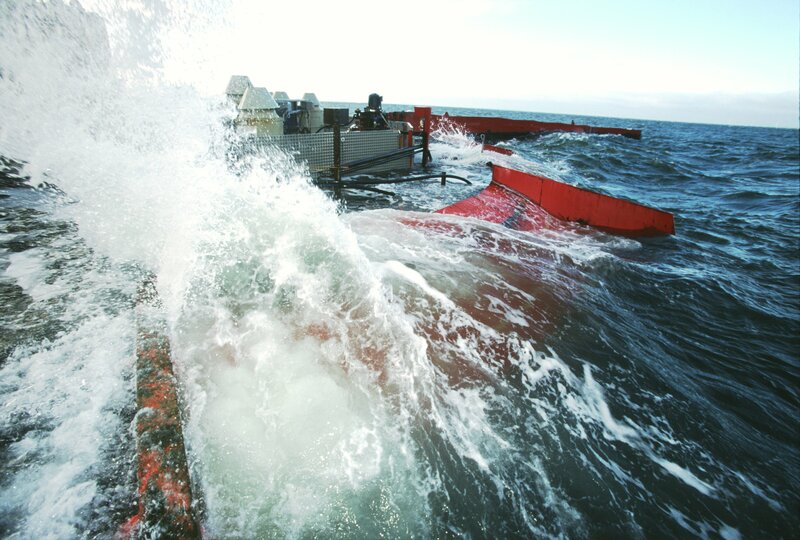 Wave Dragon is a large-scale technology for the generation of electricity from ocean wave energy. Invented by Erik Friis-Madsen, it has been developed with funding support from the European Union, the Welsh Development Agency, the Danish Energy Authority and the Danish Utilities PSO Programme. The central, front face of the device is a doubly-curved ramp, up which incoming waves surge (as on a beach). Behind the crest of the ramp lies a reservoir that gathers the water that overtops the ramp. Energy is extracted as the water captured in the reservoir is allowed to drain back to the sea through a number of low-head hydro turbines located within the reservoir. The amount of energy captured by the device is increased by long reflector wings mounted either side of the reservoir, which channel the waves towards the central ramp. The device is slack moored for and aft to allow it to turn into the principal wave direction. A large scale prototype launched in 2003 was the world's first offshore grid-connected wave energy device. This test unit has supplied electricity to the grid in more than 20,000 hours – a world record. A 7 MW demonstration project is currently being applied for in Wales, and preparations are underway for a 50 MW array in Portugal. Wave Dragon is a large offshore wave energy converter of the over-topping type; a floating hydro-electric dam and represents state of the art technology within the field of wave energy converters. The heart of the unit is a large floating reservoir. Two reflector wings concentrate the power of oncoming waves, which pass up a curved ramp and into the reservoir. The water returns back to sea through a battery of low-head turbines. are managed by Wave Dragon ApS.